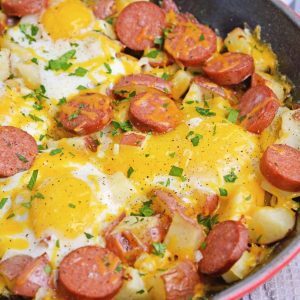 Sausage and Egg Skillet is a delicious breakfast skillet with andouille sausage, potato, eggs and gooey cheese. Ready in 30 minutes and perfect for special weekend brunch! Preheat oven to 400 degrees. Heat olive oil in 10 inch cast iron skillet or other oven proof pan over medium-high. Add potatoes and cook for 3-4 minutes, stirring to make sure they don't stick to the bottom. If they absorb all of the oil and/or stick, add just a little bit more olive oil. Add onion, salt and pepper and continue to stir. Cook for an additional 5 minutes or until onions are soft. Potatoes will start to soften, but won't be fully cooked. Add andouille sausage and cook for another 2 minutes. Using the back of your spoon, form 4 wells. Crack eggs into each well. Transfer pan from the stove top to the oven. Cook for 5 minutes. Remove, top with sharp cheddar cheese and return to the oven. Change oven setting to broil. Watch carefully and remove when cheese is melted and bubbly. Remove and top with fresh parsley. Serve Potato, Andouille Sausage and Egg Skillet piping hot. ** If you like your eggs runny, saute potatoes until they are fully cooked and omit baking on 400 degrees for 5 minutes. Instead go straight to broiling and melted cheese.